The Global Network of Networks of Computers is called as Internet . Also described as a Network of Computers . Another group argues as '" The Network of People " . Because, it is ultimately the people who established these systems . Practically, INTERNET is the network of People, by the People and for the People all over the world. Another net is Intranet....What is It? The networks of Computers within an organisation is called "Intranet" .Such networks are available in a Bank, an University, Government Departments,etc.. These are exclusively for the internal use of the members who are provided with User ID. The outsiders cannot use such systems.whereas in the case of Internet, anybody can avail the information from it. is a group of computers located in the same place like an office building, a school, or a home. This is for sharing resources like files, printers, games or other applications. 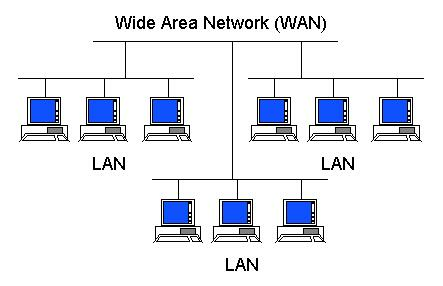 LAN in turn can be connected to other such LANs and to the WAN or Internet. is the Network spread over a city. The cable TV network spread over a city is one example for MAN. Here, the hardware and software resources are shared among the users of MAN. is a network covering a broad area ,generally linking across regional and national boundaries. Commercial and other Business organisations , government departments utilize WANs to communicate and transfer data among employees, clients, buyers, and suppliers from various geographical locations. These help the owners to enhance the effectiveness and efficiency of their operations as time, energy and money is saved upon besides being highly responsive to their clients .